Multiple RNA interaction can be modeled as a problem in combinatorial optimization, where the “optimal” structure is driven by an energy-minimization-like algorithm. However, the actual structure may not be optimal in this computational sense. Moreover, it is not necessarily unique. Therefore, alternative sub-optimal solutions are needed to cover the biological ground. 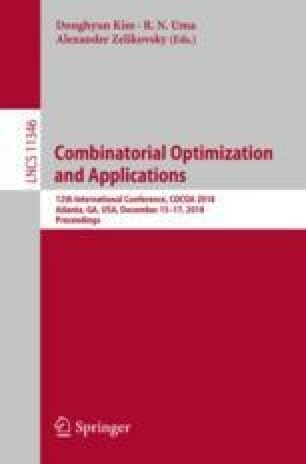 We extend a recent combinatorial formulation for the Multiple RNA Interaction problem with approximation algorithms to handle more elaborate interaction patterns, which when combined with Gibbs sampling and MCMC (Markov Chain Monte Carlo), can efficiently generate a reasonable number of optimal and sub-optimal solutions. When viable structures are far from an optimal solution, exploring dependence among different parts of the interaction can increase their score and boost their candidacy for the sampling algorithm. By clustering the solutions, we identify few representatives that are distinct enough to suggest possible alternative structures. Supported by a Research Starter Award in Informatics from the PhRMA Foundation www.phrmafoundation.org. be the |S| windows in the order defined by the partial order relation follow (from Sect. 2) extended to a total order in a deterministic way. where \(\cap \) and \(\cup \) represent the standard intersection and union operations on sets respectively, and intervals are treated as sets of integers. Recall that a symmetric window \(w(l_1,l_2,i,j,u,v)\) satisfies \(u=v\) (and typically consists of u base pairs). When applying the distance function, a non-symmetric window is first converted to consecutive symmetric windows by maximizing the number of base pairs (but otherwise is still reported as a non-symmetric window in a given solution).